If you are a small business person or want to start a new business, this book will help you. It assumes that you have a tight advertising budget and have to get the best bang for your buck. In this way, it differs from many college and university text books which are generally written from the viewpoint of large companies or multinationals which have huge advertising budgets. You will learn the use of advertising "hooks" and how they differ for the business market as opposed to the consumer market. The chapter on direct mail advertising will take you through the steps in creating an effective direct mail piece. The Internet offers tremendous opportunities for advertisers in this digital age, yet many small companies have failed to establish themselves in cyberspace. You may consider that is too expensive or too complicated. Hopefully, this book will help to dispel those ideas and lead you through the steps to establishing an effective Web presence. You will find that this book places an emphasis on the less expensive forms of advertising such as direct mail, print media, yellow pages, signage, trade shows, telemarketing and fax broadcasting. Less emphasis is placed on broadcast media, since this tends to be expensive and often beyond the budget of smaller companies. You will find that it places an emphasis on trying to use offline media to drive traffic to your Web site, where you can display more detailed information. The final chapters discuss some of the topics you will need to address in preparing your advertising plan. You will also learn about some of the standards and laws which apply to advertising as well as rules about privacy. This book covers a wide range of advertising methods and how to evaluate them. It’s up to you to choose which ones work best for your business. Chapter 1 - The Advertising "Hooks"
Chapter 19 - Let’s Get Started! 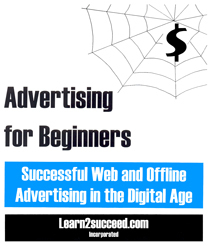 Advertising for Beginners: Successful Web and Offline Advertising in the Digital Age by: Learn2succeed.com Incorporated: Softcover; 146 pages; ISBN: 978-1-55270-251-9 published in 2009; $24.95.